Simple Guide to Travelling with Children In and Out of South Africa. Your Questions Answered. 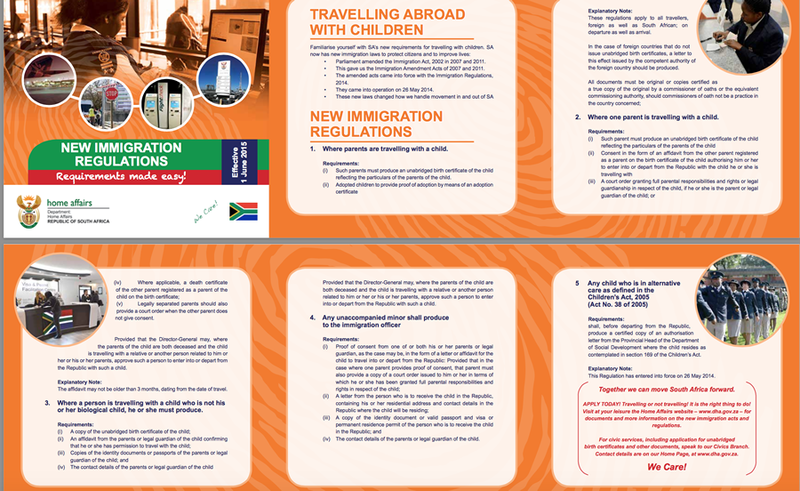 The new immigration regulations concerning travelling with children in and out of South Africa, implemented on 1 June 2015, have caused some confusion and a flood of questions. Here’s a guide that should make it simple and hassle-free so that you can focus on having a holiday while the SA government can focus on ensuring children are not trafficked across its borders. Hopefully, armed with this information, you too can travel out of South Africa as easily as Omar al-Bashir! What age children does this apply to? Does it apply to South African children only or foreigners too? Both. Unless the foreign national children are travelling with a visa in which case they would have had to submit an unabridged birth certificate when applying for their SA visa. an unabridged birth certificate (UBC) – or Equivalent document – showing the particulars of both the child’s parents. What if the child is legally adopted? Proof of adoption by means of an adoption certificate is required, as well as the UBC. What is an unabridged birth certificate (UBC)? In South Africa, a UBC is an extract from the Birth Register containing the particulars of a minor and those of his or her parent or parents. UBCs are official documents issued by the Department of Home Affairs. All birth certificates containing the details of a child as well as the parents of the child shall be accepted for the purposes of these Requirements as UBCs , regardless of the country of issue. Then you will need to provide an ‘Equivalent document’ containing the particulars of the child and his or her parent or parents, issued by the ‘competent authority’ of your country. The document could be a letter issued by a foreign government (including a foreign embassy) – click here for the suggested format for Equivalent document. An Equivalent document can also be any official document (such as an identity document or passport issued by the relevant authority of any country) which records the identity of the parents of a child. eg. Indian passports include the parents’ names on the passport. This will be accepted in lieu of a UBC. Do documents have to be originals? Yes, original documents are required OR copies that are certified as the copy of the original by a Commissioner of Oaths or the equivalent Commissioning authority in your country. What does a child need if travelling with only one parent? a Parental Consent Affidavit granting authorisation for the travel by the non-travelling parent (ie. the other parent who is registered as a parent on the birth certificate). What details must the Parental Consent Affidavit contain? The Parental Consent Affidavit must include full contact details and copies of the identity documents or passports of the parent/s or legal guardian of the child. 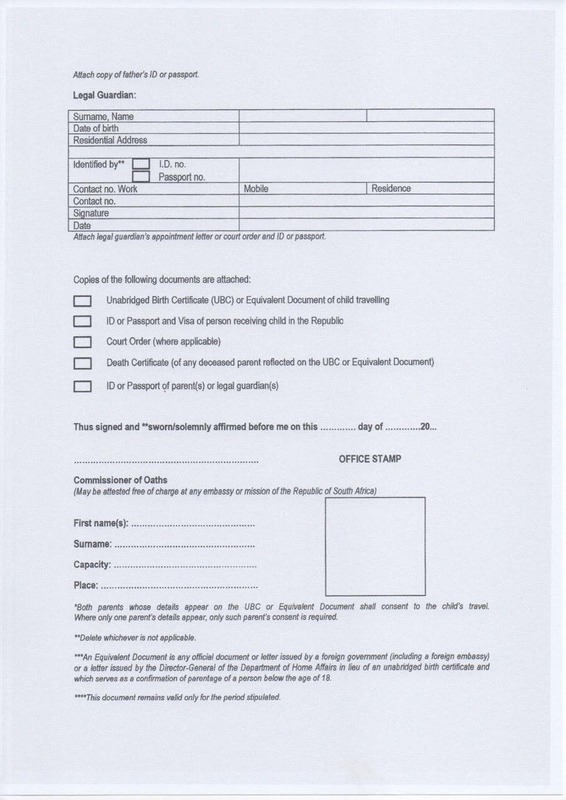 Here is the suggested format for this Affidavit, as provided by the Department of Home Affairs (DHA). Print it off and fill it in – for PARENTAL CONSENT AFFIDAVIT, click here. How long does an Affidavit last? The Affidavit may not be older than three months, dating from the start date of travel ie. when presented. (On some pages on the DHA’s website it says four months and in 2017 this was changed to six months.) The same affidavit will still be valid for the departure or return in relation to the same journey regardless of the period of the journey. I’m overseas and it’s yet another extra cost to get a Commissioner of Oaths to sign my Affidavit. You can get your Affidavit attested free of charge at any South African Embassy or mission in your country of residence. What if the non-travelling parent is no longer in the child’s life? Please then provide a court order which shows full parental responsibilities and rights or legal guardian of the child have been granted. What if the non-travelling parent does not give consent? What if the non-travelling parent has passed away? Please provide a death certificate. 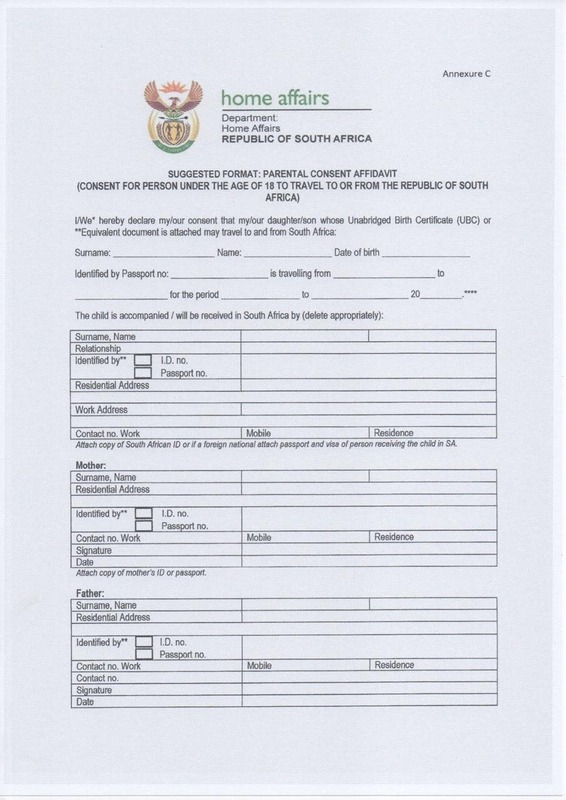 Where a non-travelling parent is unable to consent to the travel because of a recent death or particular disability, the person acting on behalf of the child may apply for a special dispensation from the Director-General of Home Affairs of South Africa by writing to: consent@dha.gov.za (include full motivation and supporting documents). What if both parents have passed away? Then the legal guardian/s should fill in the Affidavit and attach their appointment letter or court order and ID or passport. What if the non-travelling parent’s details do not appear on the UBC? Where only one parent’s particulars appear on the UBC or equivalent document, no parental consent affidavit is required when that parent travels with the child. What does a child need if travelling accompanied but without either parent? contact details of the parents (or legal guardian) of the child. These requirements above also apply to children travelling with school groups. What does a child need if travelling alone ie. an unaccompanied minor? letter from the person who is to receive the minor containing that person’s residential and work address, and full contact details PLUS a copy of the identity document or valid passport and visa or permanent residence permit of the person who will be receiving the child in South Africa. I applied for my child’s unabridged birth certificate months ago and have still not received it. There has been a backlog, and there are hundreds of applications where supporting documents were not sent in. The Department tries to get hold of applicants through text messages but some people’s numbers may have changed. 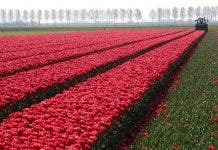 072 634 0589; 072 634 0614; 073 567 6208; and 073 567 5968. Visit any office of Home Affairs to request a document that will allow you to travel with children through South Africa’s ports of entry. Where both parents are travelling with valid passports and visas the unabridged birth certificate is not a requirement since these additional documents would have been provided when applications were made for passports and visas. Minors in possession of valid SA visas are not required to produce additional documents when travelling through a port of entry of the Republic. I’m a foreigner. How do I know if I need a visa to visit South Africa? How do I get a copy of my South African-born child’s unabridged birth certificate? Apply at your nearest Home Affairs office where your Biometric information will be verified. You will need your ID book, as well as your child’s ID number. All documents submitted must be originals or certified copies. Certified copies of documents are usually valid for 6 months only. The Unabridged Birth Certificate, which currently costs about R75, can take approximately 6-8 weeks from date of application. Since 14 March 2013, Unabridged Birth Certificates have been issued automatically for newborns. For South Africans abroad, visit your nearest SA Embassy. Do foreign unabridged birth certificates, that are not in English, have to be accompanied by a sworn translation? No. This is no longer the case. The DHA now has in its possession a specimen of unabridged birth certificates – or equivalent – from all countries. Immigration Officers are able to use these specimens to verify travellers’ documents without requiring translations anymore. 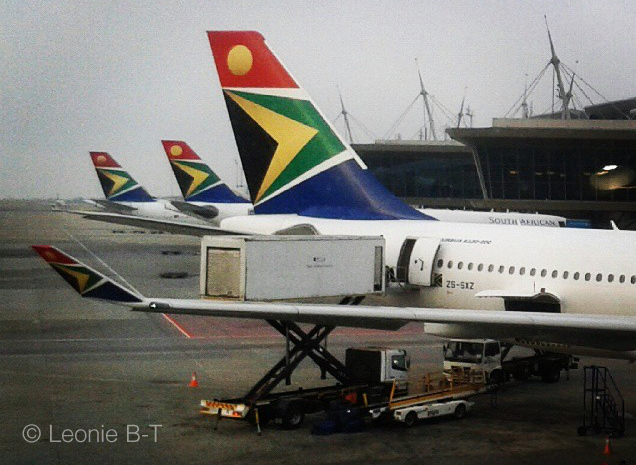 We will be in transit at OR Tambo International Airport. Does our child still need a UBC? No. No supporting documents will be required in the case of minors in direct transit at an international airport. Are these regulations really here to stay? It appears the regulations are here to stay, but that they may be modified over time. On Friday 12 June 2015, the DHA welcomed the South African Cabinet’s reaffirmation of the Immigration Regulations and, in particular, the requirements for travelling with children through South Africa’s ports of entry. Minister Malusi Gigaba will be convening a team comprising security and economic clusters in order to increase consultation and compliance between the DHA and key stakeholders in the aviation, tourism, travel and hospitality sector. The team will be tasked with seeking a balance between SA’s economic development as well as security needs. The DHA says that the team will also address administrative issues that may have been experienced since the requirements for travelling with children were implemented on 1 June 2015. 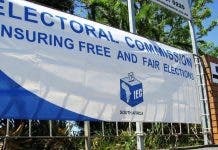 All information on this page sourced from South Africa’s Department of Home Affairs.